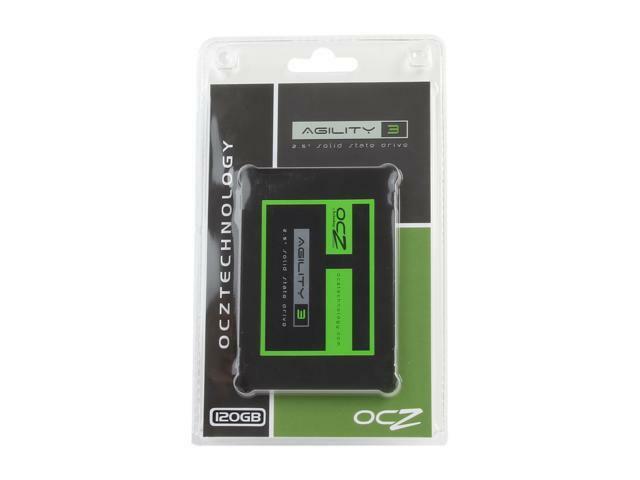 OCZ Agility 3 SATA III Solid State Drives are designed and built to provide an exceptional balance of performance and value. The Agility 3 Series implements the cutting-edge SATA 6Gbps interface to deliver excellent sequential and random data transfer rates, significantly improving your computing experience over hard drives. In addition to enhanced performance, an Agility 3 upgrade promotes cooler, quieter, and more energy efficient conditions compared to traditional mechanical hard drives. With no moving parts, SSDs provide peace of mind with their superior durability and reliability. Unique and innovative, Agility 3 SSDs deliver a one-of-a-kind storage solution. A Superior PC Experience In addition to enhanced performance, an Agility 3 upgrade promotes cooler, quieter, and more energy efficient conditions compared to traditional mechanical hard drives. With no moving parts, SSDs provide peace of mind with their superior durability and reliability. TRIM Support The OCZ Agility 3 offers native TRIM support featured in Windows 7 and Windows Server 2008 R2. Designed to maintain the performance of SSD at an optimal level over the lifetime of the drive, TRIM functions by actively deleting invalid data from the SSD’s memory cells to ensure that write operations perform at full speed. Since a memory block must be erased before it can be re-programmed, TRIM improves performance by pro-actively erasing pages containing invalid data, allowing the SSD to write new data without first having to perform a time-consuming erase command. S.M.A.R.T. Technology The OCZ Agility 3 adopts Self-Monitoring, Analysis and Reporting Technology (S.M.A.R.T.) which enables the PC to predict the future failure of hard disk drives. Through the SMART system, hard disk drives incorporate a suite of advanced diagnostics that monitor the internal operations of a drive and provide an early warning for many types of potential problems. When a potential problem is detected, the hard drive can be repaired or replaced before any data is lost or damaged. ECC Recovery Designed with the file verification and repair tool- ECC Recovery, OCZ Agility 3 provides up to 55 bits correctable per 512-byte sector (BCH), protecting your important files and sensitive data against digital corruption by using Reed-Solomon codes. Other Thoughts: Ok WAY back in the day when SSDs were expensive it was cheaper to buy 2 120GB and RAID 0 them into 1 240GB drive, great and it worked for a long, long time. Then one day one died, and took the whole raid with it. RMAed it got a new drive but it wasn't a match (128gb vs 120gb) so I could no longer RAID 0 them, by then SSDs were check and I picked up a 500GB Evo. I also up dated the firmware on the one that didn't die and it's still running to this day. Other Thoughts: I didn't expect this drive to last so long. Was the primary drive when i installed it into an older thinkpad as a refresh, the moved it into my desktop where it has been the boot drive for the last two years. still works great, but waiting for the inevitable SSD drive fatigue. Cons: initial drive was DOA. replacement dead just outside of warranty by not even a month. Other Thoughts: warranty was good for 3 years. after an initial RMA of a dead drive, i find myself at just past the 3 year mark with this drive dead yet again, talk about planned obsolescence! now looking for a new ssd, and not an OCZ. Pros: I've had 4 of these in a Raid 0 for nearly 4 years now, all drives working perfectly since day one. Cons: I'm not sure that I'd buy these drives again if I needed to ever replace/upgrade them because there are newer drives in existence now, but I'd definitely give OCZ my recommendation. Pros: Packaged in the plastic that is impossible to open with anything short of a blow torch, not sure if that is a pro still. Cons: DOA within a week. I moved on and went for Intel. Other Thoughts: I am sure it would have been great if it had worked longer than 4 days. Other Thoughts: Reading all other comments about how they had bad SSD's and etc... Have you guys thought of checking to see if there was a firmware update for them? Can save your SSD from failing if they kept on updating firmware.. just information... I have updated mine since I got all 3 drives..
Pros: Was cheap when I purchased, extremely fast. Has proven to be flawlessly reliable for 3.5 years as my only drive in my core i5-2500K system. Cons: None other than not free. Other Thoughts: I used this as my only drive. OS and Apps are on this drive. I disabled paged memory, I have 8GB, and my usage showed I didn't need it. System is fast, reliable. Zero issued with SSD, while 2 external mech HDs have failed. This drive will be transferred over to new build, will be 2nd drive, with Samsung EVO Pro as primary. WoW loads in a few seconds, as opposed to 90sec with my old 7200rpm Seagate mech.